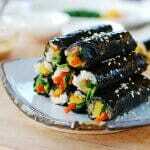 This child-size gimbap (or kimbap) is called ggoma gimbap (꼬마김밥) because of its small size. Ggoma means a little one or little kid in Korean. 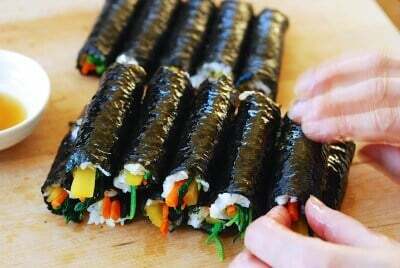 It’s also known as mayak gimbap (마약김밥). 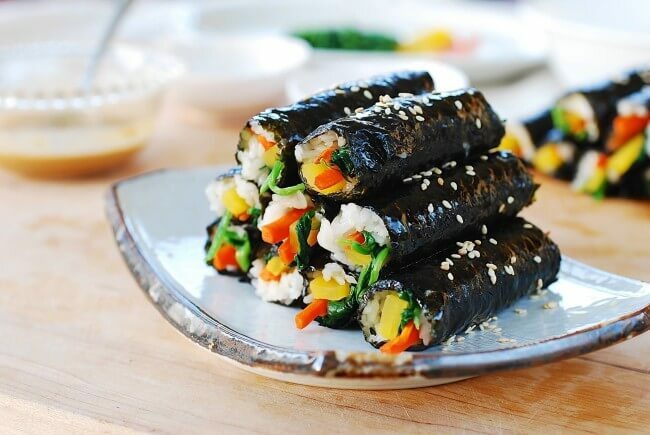 Mayak means narcotic drugs, so the name comes from this gimbap’s reputation for being addictive. It’s a specialty of Gwangjang Market (광장시장), a bustling, crowded market in the center city of Seoul, where the merchants came up with the idea to serve these little guys with a sweet and tangy hot mustard sauce. 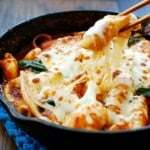 It’s this sauce that makes the gimbap addictive. By the way, if you travel to Seoul, Gwangjang Market is a fun place to visit, which boasts, among other things, all sorts of street food. The market is a popular place for both locals and tourists. 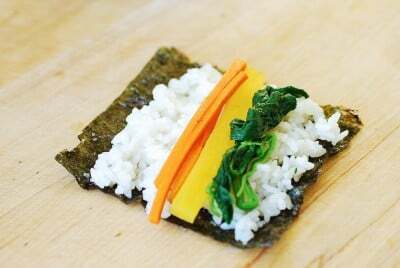 Unlike traditional gimbap, this mini gimbap uses minimal ingredients, which takes no effort to roll up. 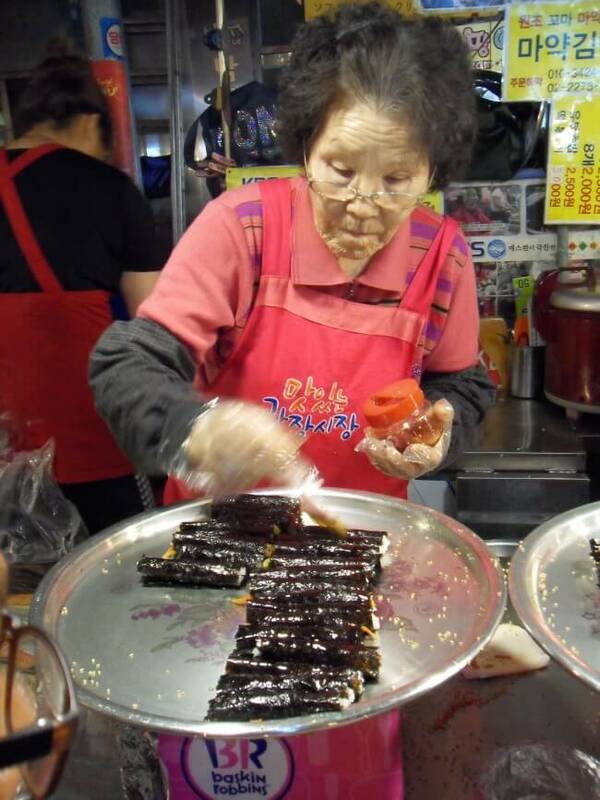 The gimbap I tried in Gwangjang Market, during my trip last year, had only two ingredients in it — yellow pickled radish and carrot, but generously brushed with sesame oil. I used three ingredients here — pickled radish, carrot, and spinach. 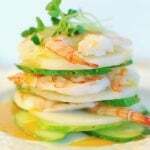 You can substitute julienned cucumber for spinach. 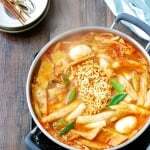 I am not sure what secret ingredients the merchants use for their mustard sauce, but a typical hot mustard sauce includes hot mustard called gyeoja (겨자), vinegar, soy sauce and sugar. 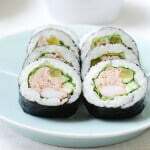 Here, I tried it with dijon mustard and added finely ground sesame seeds for extra nutty flavor to pair with the sesame oil laden gimbap. It’s addictive! Bring a large pot of water to a boil over high heat and prepare an ice bath. Blanch the spinach, place immediately in the ice bath, then squeeze the water out. 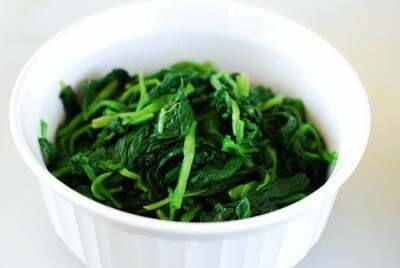 Run a knife through the squeezed spinach a couple of times. Season with the sesame oil and salt. Julienne the carrots. Heat a lightly oiled pan over medium high heat. Stir fry the carrots until slightly softened. Lightly season with a pinch of salt. Cut the pickled radish crosswise in half, and then cut lengthwise in half. When all the ingredients are ready, remove the rice from the rice cooker. While the rice is still hot, add the sesame oil and salt. 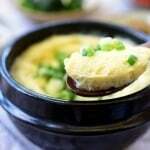 Mix well by lightly folding with a rice paddle or spoon until evenly seasoned. Cut 4 sheets of gim into quarters. Put a quarter sheet of gim, shiny side down and shorter side toward you, on a cutting board. 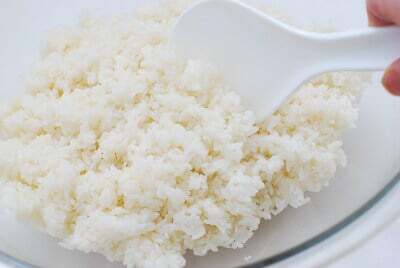 Spread 1 tablespoon to 1-1/2 tablespoons of rice evenly over the gim, leaving a little bit of space on the side away from you. Do this with your fingers. Keep wet towel and wipe your fingers frequently to keep the rice from sticking to your fingers. Lay the prepared ingredients on top of the rice, closer towards you. Lift the entire bottom edge with both hands and roll over the filling away from you, tucking in the filling with your fingers. 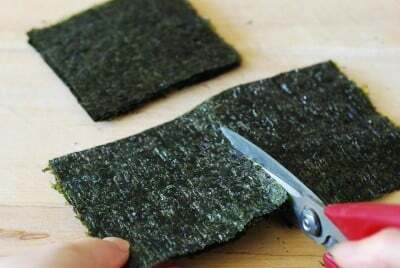 Rub or brush the roll with a little bit of sesame oil for extra flavor and a shiny look. Finely grind the sesame seeds in a spice grinder or mortar bowl. 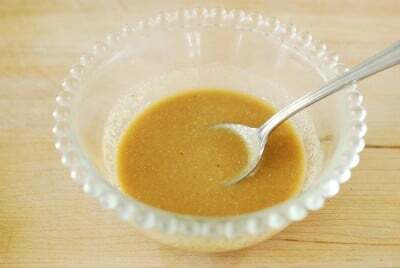 Mix with the remaining sauce ingredients. Stir well until the sugar is dissolved and the ground sesame seeds are evenly distributed. Post me more receipts on sushi roll I like it. Thank u! This looks so yummy! I’m a mom of three young children who will love this! 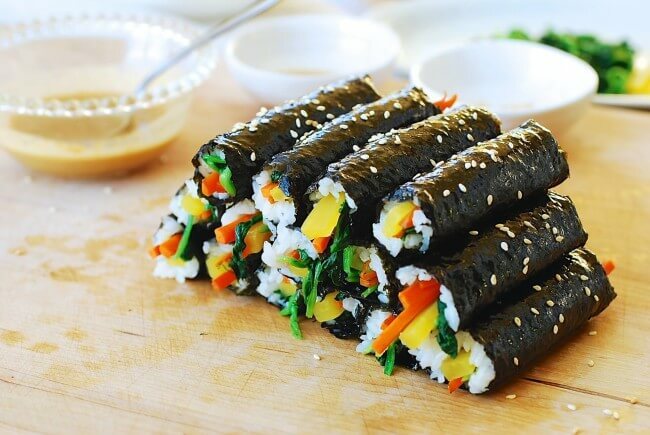 Yeah this gimbap is great for children, and easy for mom to whip up to feed hungry children. Enjoy! 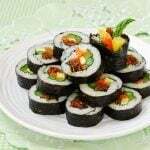 I love Gimbap! and what a smart thing to make for lunch during the summer. Thanks for the recipe and for the dipping sauce recipe! You’re welcome, Angie! Hope you get to make it soon. Thank you so much for today’s post. I visited gwangjang market today and tried the Gimbap, they were incredibly delicious! That’s awesome! I’m glad to hear you went and enjoyed the gimbap. Enjoy your stay in Seoul. I’m envious of you. 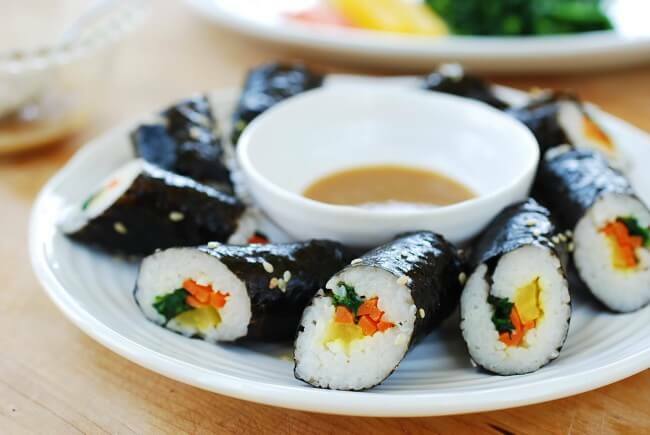 Thank you my boys will love this- a quick and easy way to make gimbap! Could you suggest a meat filling that would be good for these? Beef strips will be good. 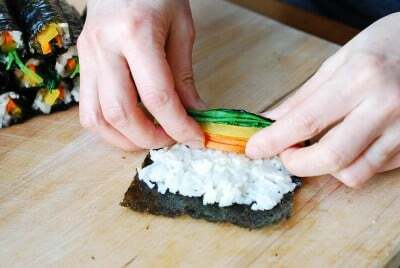 See my traditional gimbap recipe that’s linked in the headnote of this post. Spam or hot dogs will be good too. 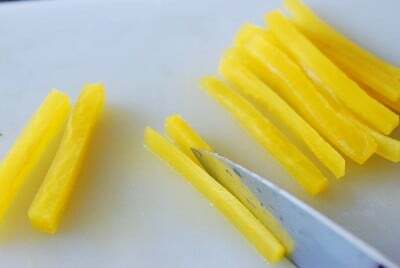 Just cut into thin strips and stir-fry quickly before using. Enjoy! Hello there, I would love to make these for my wife but she’s allergic to carrots (regular orange carrot) . 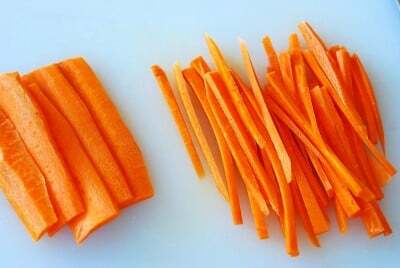 Can you please advice what is a great substitute beside’s carrot. How about red (or orange) bell pepper? Thinly slice and stir fry lightly with a little bit of salt. 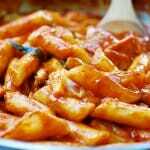 You can also thinly slice kimchi, squeeze out the liquid, and mix in a little bit of sesame oil. 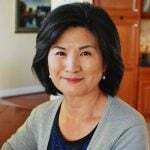 Go to my traditional gimbap recipe and see if you want to use any of the ingredients listed there. You can also use thinly sliced and stir-fried spam or hot dog if you want. thanks for this recipe! I’ve been wanting to make something different for my son’s lunchbox, so I’m excited to try this. One quick question- when sesame oil is called for in a recipe, is it always the toasted sesame oil? 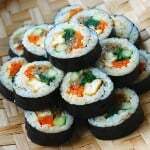 Gimbap is always nice for lunch box! I think you meant sesame seeds. If so, yes! Awesome! I am so happy to hear that. It will be great for a potluck. Thank you, Michelle!